"The artist for this illustration is Canadian-born Bruce McCall, whose specialty is creating surreal and satirical fantasy scenes, often related to transportation.Note the purple Saskatoon Airport Duty Free bag in the aisle. Here, McCall pokes fun at the tiny duty free shop at the John G. Diefenbaker International Airport in Saskatoon, where the only international flights are Delta Connection and United Express CRJs to MSP and ORD respectively. 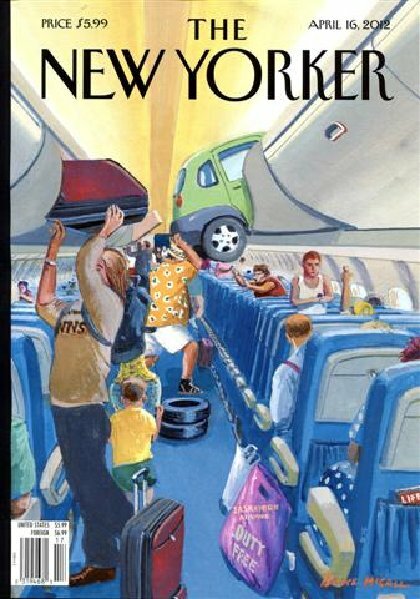 However, since this scene shows a full-size aircraft, it is obviously a depiction of passenger boarding for a departing Northwest Airlines flight. NW operated DC-9s between YXE and MSP; in fact, NW served more Canadian cities than any other American airline. I can attest, having worked Saskatoon many times, that there is in fact a Duty Free shop (more of a stand, really) at YXE, and it carries gin and my favourite brand of Canadian rum, called Lamb's Navy. What McCall doesn't show are the fishing rods and deer, antelope and moose antlers that passengers would often carry onboard with them during the Autumn hunting season, Saskatoon being a gateway to the Saskatchewan outback for hunters and fishermen. Usually wrapped in protective bubble wrap, these were often very difficult to stow. That's my NWA reminiscence for today. RD"